This past Sunday I played my first ever game of Bolt Action, Warlord Game's WWII 28mm skirmish wargame. Boutique FDB is home to a slow-grow league open to new players. 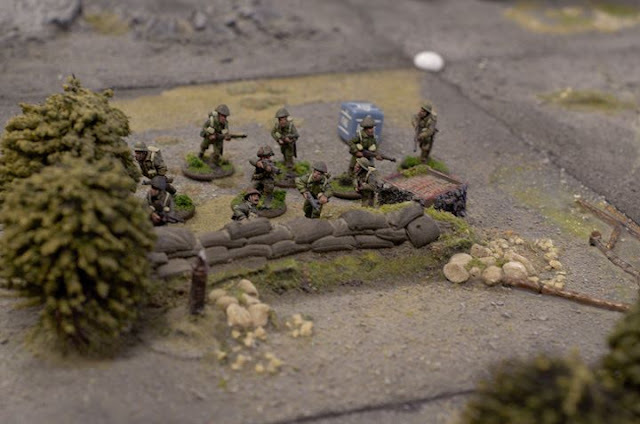 Having painted a rifle platoon of Canadians many years ago for a different set of rules, miniatures which had never fired a shot in anger, I was looking forward to having a go. Consequentially I picked up a copy of the rules on Thursday, read them at top speed and prepared my forces. This week we were fielding 500 points which was just about a perfect fit for my three rifle sections. I hoped that my lonely PIAT team would be enough to keep any tanks from savaging my infantry. The league is a casual affair with players showing up and building their lists to account for their opponent's capabilities. We actually played to a range of points, from 500-650, depending on each player's collection. Since I brought a 500 point list my opponent rebuilt his to match. I wasn't the only inexperienced player there which made me feel better about my shaky grasp on the rules. My opponent used to play Bolt Action years ago but this was his first game in the new edition. 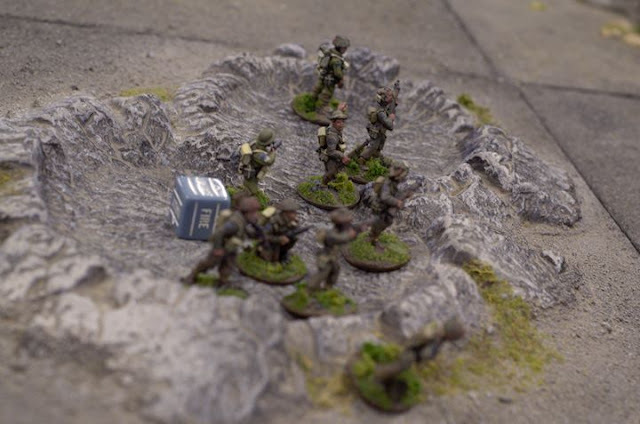 He had read about what had changed but hadn't had a chance to go through the new rulebook which meant the first few activations were halting as we looked up to-hit charts and the effects of difficult terrain. Fortunately there aren't many modifiers to remember and by the second turn we were flying. I'm glad I'm fresh to this edition; it's always hard trying to remember rules changes between editions. The battle was fought between a rifle platoon of Royal Highland Regiment of Canada and some nameless Waffen SS. I had three regular sections with an LMG, my HQ, a free artillery observer and the aforementioned PIAT team. My opponent had a veteran rifle section with two LMGs, a veteran section armed with SMGs mounted in a Hanomag and his HQ mounted in a Kubelwagon. 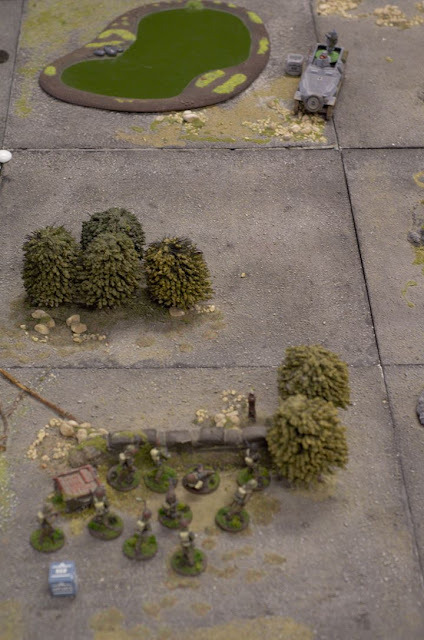 At this range and with the sandbags counting as heavy cover his Hanomag needed to roll a 6 on a D6, followed by a second roll of a 6 on a D6 and then you can roll to wound. 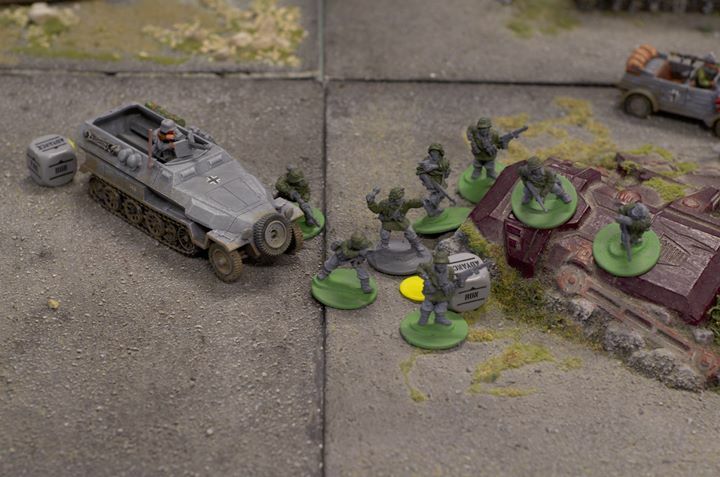 We played a simple scenario of kill the other side on a board better suited from Warhammer 40,000 than Bolt Action. We both deployed in cover on our sides of the board and I spent the first few turns moving forward into craters to try to take the fight to the Germans. With his Hanomag and Kubelwagon's MMG it was a treacherous advance but I was able to avoid taking casualties due to the range and heavy cover. I also scored some lucky hits which required double-sixes, and even managed to remove one of his infantry section's LMGs with an extraordinary damage roll. A rifle section advances through shell craters, taking advantage of the cover they offer. The game took a hard turn when one of my infantry sections wasn't able to make it all the way to their next cover and the Germans advanced his half-track and accompanying infantry section to wipe out my section at point blank range. Seeing an opportunity and vastly under-estimating the combat strength of his section I launched an assault. My unit was 10 men strong with two SMGs vs 8 men and 7 SMGs. In addition the Germans were veterans and my troops were just regulars and he was in cover. We were both playing from the core army lists so I didn't have any national characteristics to help me out. This mean that we would roll to wounds with the German fighters able to roll any successful to-wound rolls to attempt to score an extra wound. In Bolt Action close combat is decisive. Whoever scored the most wounds wins and the loser is completely destroyed. I was rolling 10 dice and my opponent 8. I needed a 5+ and two of my dice would allow me to roll again if I wonded. My opponent only need to roll 4+ and seven of his dice could add an extra wound. Had I known this it is unlikely I would have made the charge but I was prepared to take my lumps without complaint. Seeing their friends wiped down this section assaulted the SMG section despite only having a slight advantage in numbers but a clear disadvantage in firepower. This is the Black Watch, however, who's motto is Nemo Me Impune Lacessit. No one provokes me with impunity. Boy do I wish I had thought to shout that when the dice settled. When the dice settled I had scored four wounds and my opponent only two. Of his two wounds only one was from an SMG and that re-roll failed to wound. I had carried the day with only light casualties and as an added bonus my infantry was closer to both his Hanomag and Kubelwagon than his infantry so they were also considered destroyed. In one ill-advised attack I had managed to destroy three of my opponent's five units. My opponent decided that his remaining troops would likely fall back and we called the game a Canadian victory. This was my first time playing Bolt Action and I thought I'd share my thoughts on it. I originally built my force for Too Fat Lardie's Troops, Weapons and Tactics but never actually played. My first thought was I liked how loose the army building was. Weapons and troops are broadly classified which allows for great freedom in choosing what equipment to use. Gear-heads may dislike the abstraction but since I have more interest in the lowly infantry it suits me well. 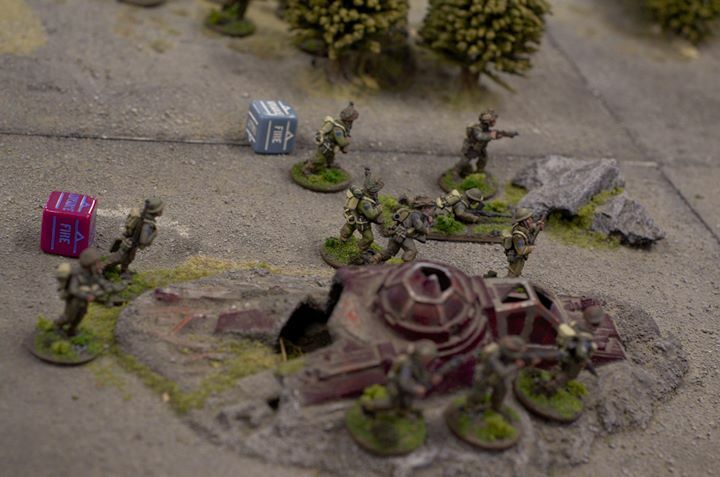 The terrain wasn't exactly ideal for Bolt Action but it was a fun game. While playing I was a little overwhelmed by the modifiers and charts but in practice these were simple to remember and didn't require much reference during play. Remembering 3+ to hit plus a handful of modifiers meant that calculating dice rolls quickly became second nature. Bolt Action is a game which quickly gets out of the way of moving miniatures around the table. It isn't Warmachine and the lack of tight rules may be a deterrent to some but I find it refreshing and suited to my preferences for telling stories. All that remains is to track down a QF 6lber anti-tank gun to meet the points requirement for the next round and take the pressure off my poor 12" ranged PIAT. These small infantry anti-tank weapons are more suited from deterring tanks from approaching too closely but do little against fast moving machines firing from distance. Which do you prefer, Bolt Action or Flames of War? The clear favorite with the Dice Devils is FOW. Leave a comment with your preferences. After subscribing to this blog don't forget to subscribe to my main blog. You can also follow me on Twitter and Instagram to see what I'm painting. With hard plastic miniatures I can understand why.